It is believed that the “valentine” was the first greeting card. Valentine’s Day is the second largest card sending and receiving day each year only surpassed by Christmas. One billion valentine cards are sent each year. 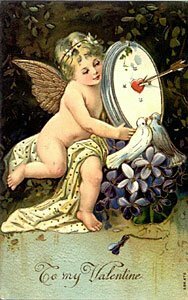 The first written valentine is attributed to a young Frenchman, Charles, Duke of Orleans. From his confinement in the Tower of London after the Battle of Agincourt in 1415, Charles fought his lonely confinement by writing romantic poems or rhymed love letters to his wife in France. About sixty of them remain. They can be seen among the royal papers in the British Museum. During the fifteenth century, one valentine showed a drawing of a knight and a lady, with Cupid in the act of sending an arrow to pierce the knight’s heart. By the sixteenth century written valentines were so ommon that St. Francis de Sales, fearing for the souls of his English congregation, sermonized against them. During the seventeenth century people made their own valentines using original verse or poems copied from booklets with appropriate verse. The Victorians took the cards to elaborate lengths, trimming them with lace, silks and satins and embellishing them with special details like feathers, flowers, Cupids and hearts, gold leaf, hand painted details and even sweetly perfumed sachets. The first commercial valentines appeared circa 1800 and were rather simplistic. Cards were hand-delivered. Until the mid-1800’s, the cost of sending mail was beyond the means of the average person, and the recipient, not the sender, was expected to pay the cost of mailing. It wasn’t until the advent of the penny posts that the modern custom of sending Valentine’s cards really gained critical mass. By the 1830’s and 1840’s Valentines contained delicate and artistic messages. Valentines made of fine papers and decorated with satin, ribbon, or lace commanded high prices. They had pictures of turtledoves, lovers’ knots in gold or silver, bow and arrows, cupids, and bleeding hearts. All of these symbols have become associated with love and lovers. In the 1840’s the first mechanical valentines were introduced. By pulling a tab, a figure or object on the card could be made to move. Some had elaborate honeycomb pop-outs or various other three-dimensional features. Manufactured Valentine cards didn’t appear until the end of the nineteenth century. “Penny” postcards, which were popular from about 1890 to 1917, were called penny postcards because they were mailed with a one-penny postage stamp. It was very “proper” at that time to collect and display your collection of postcards and trade cards in the parlor. Friends and guests would often sit for hours, leafing through the album while they visited. The penny postcard became so popular during this era that photographers, studios, printers, and business were always trying to find new and exciting subjects to satisfy an audience that was hungry for new ideas to impress their friend at home. To make their cards stand out, people often sought out real photographic postcards. Instead of mass-produced lithographs, these were actual photographs made with a postcard printed back. The photography studios often employed women to hand tint and color the black & white photo postcards. Some of the best photo postcards came from Germany, which was also famous for its detailed and colorful lithography. Popular subjects for these photo postcards were women, children, flowers, and young lovers, posed and arranged in an effort to portray the idealized virtues of the Victorian Era. A Mount Holyoke College student, Miss Esther Howland, crafted the first U.S. made valentines. Her father, a stationer in Worcester, MA, imported valentines every year from England. Esther, however, decided to create her own valentine messages. Around 1830 she began importing lace, fine papers, and other supplies for her valentines. She employed several assistants and her brothers helped market her “Worcester” valentines. As one of our first successful U.S. career women her sales amounted to about $100,000 per year in 1847 not bad for that era!! A purchased valentine became the most popular way to declare love during the early decades of the nineteenth century. We’ve seen a change from the heavy sentimentality of earlier days to what can best be described as a light touch. Nowadays a valentine usually accompanies a more elaborate gift of candy, flowers, perfume, etc. American school children usually celebrate St. Valentine’s Day with a party at school. Prior to the party the children make a decorated box with a slot in the top. During the party the children distribute valentines to their classmates’ Valentine’s Box. Valentine cards are manufactured on an enormous scale today that range from the sentimental to sophisticated to humorous valentines. There is a valentine for everyone–sweetheart, spouse, children, parents, teacher and even your pet! Ribbons, Laces and Frills Ribbons and frills have been associated with romance since the days of knighthood when a knight rode into battle with a ribbon or scarf given him by his lady fair. The word “Lace” comes from a Latin word meaning a “noose” or to “snare”. Victorian women carried lace handkerchiefs, if a woman dropped her handkerchief a man might pick it up and return it to her thus giving a reason to meet him or talk. She might even drop her lace handkerchief on purpose! Rings In some countries men and women exchange rings when they become engaged or marry. Valentines Day has been traditionally a popular day for giving an engagement ring. Hearts To a beloved, there is no symbol as important as the heart. To give someone your heart means to give to him or her one’s whole being, for the heart is at the center of one’s existence. The heart stands for the most profound and noblest of human emotions- that of love. Thus a heart, pierced by the Cupid’s arrow, has become the most famous of the valentine’s symbols. Cupid Cupid, the mischievous son of the Goddess of Love, Venus, is supposedly responsible for people falling in love. According to the myths, anyone being hit by Cupid’s arrow falls in love with the first person he/she sees. His mischievous intentions have led to some entertaining situations in various legends. Cupid in the Roman mythology has Eros, the son of Aphrodite, as his counterpart in the Greek Myths. The names of both these Gods are used synonymously with the concept of love today. Cherubs are descendants of Cupid. They are depicted as lovable little winged creatures without arrows and quivers. Cherubs were typically not mischievous like Cupid. The rose, which is undoubtedly the most popular flower in the world, speaks of love and has been the choice of lovers in every century. If you rearrange the letters of the word rose you get Eros, the god of Love. The rose was a favorite flower of Venus, the Roman goddess of love. Red is a color that stands for strong feelings. Thus a red rose is a flower of love. There are formal meanings of different colored roses in some cultures. Each of these meanings is still used in society today, so choose your color with care. White roses are for true love and purity of the mind. Red roses are for love and passion. Yellow roses are for friendship. Black roses mean farewell. Pink roses mean friendship or sweetheart. Love Knot A series of winding and interlacing loops with no beginning and no end. It is a symbol of endless lover. People made love knots from ribbons or drew them on paper. Often a message was written on the love know. The message had no beginning or end it could be repeated endlessly. Young women in strict Muslim households used to send their pledges of love to young men through messages woven through the knots of a carpet in an Arab tradition. Hands A lady’s hand was a favorite decoration that depicted “femininity.” Adding a frilly cuff and a jeweled ring on the third finger enhanced its beauty. Clasped hands represent those of Queen Victoria and Prince Albert and were symbols of the friendship between their countries of Germany and England. When a man proposed marriage he “asked for her hand” The hand became a symbol of marriage and lover. Soon gloves also became a symbol of love. Love Birds and Doves It was thought that birds chose their mate on February 14. Lovebirds are colorful parrots found in Africa. They are called lovebirds because they sit closely together in pairs. Doves were thought to be favorite birds of Venus. They remain with the same mates all their lives. The males and females both care for their babies. Because these birds are symbols of fidelity, loyalty, and love, they have become the most endearing symbols of the spirit of Valentine’s Day. Puzzik A puzzik is a quaint sort of homemade valentine circa 1840, which was a puzzle that the receiver had to solve. Not only did she have to decipher the message but also to figure how to refold the paper once it was opened. The order of the verses was usually numbered, and the recipient had to twist the folds to determine what was being said. Rebus Although it had many forms, a rebus usually was a romantic verse written in ink with certain words omitted and illustrated with a picture. Meant to be a riddle, they were not always easy to decipher.